There are some places you only stumble across when you are prepared to get off the beaten track. In the case of Glenreagh in Northern New South Wales, it was a matter of leaving the Pacific Highway at Coffs Harbour and following the North Coast Railway line along Orana Way some 40 km north to Grafton. Allowing some time to stop and take photos of trains between Karangi and Coramba, where the road parallels the railway, you should reach it by car in around an hour. And due to the efforts of the local Glenreagh Mountain Railway volunteers, Glenreagh's railway station building (photographed above in 2009), is still standing beside the North Coast Line. Glenreagh Railway Station as I photographed it from the mainline in 2007. Now the North Coast Line was first completed between Sydney and South Grafton in 1915, and Glenreagh Railway Station (some 651 km by rail from Sydney) opened in that same year. In 1924 a branch line from Glenreagh to the mountain town of Dorrigo was opened, although a washout on the line in 1972 would ultimately seal it's fate. The line was never re-opened and the stations that dotted the branch line on its climb up the steep mountain track were all officially closed in September 1975. 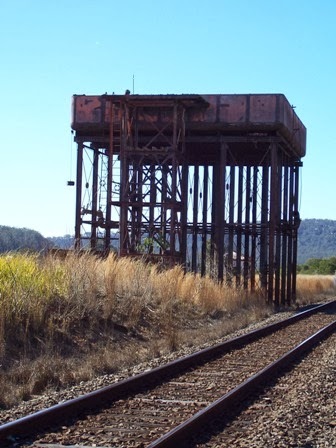 A still standing example of a New South Wales Railways 20,000 gal water tank from the steam era. 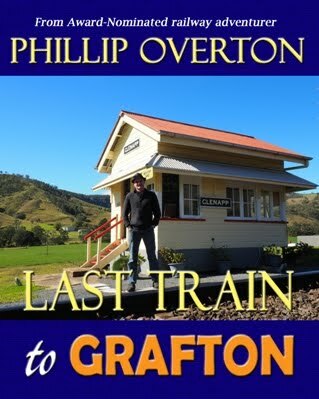 I can almost hear the heavy chant of a steam engine as it pulls away towards Grafton. Although there is no record of when Glenreagh Railway Station officially closed, I do recall our train stopping there when travelling on the Murwillumbah XPT to Sydney in both 1991 and 1993. Even back then there was a small motley collection of rollingstock sitting idle in the goods yard. One way to improve the travel time of the XPT's on the North Coast and Murwillumbah lines in the 1990's, wasn't to improve track speeds, but rather to eliminate some of the stops along the way. And Glenreagh, like many other small stops along the North Coast line, was simply omitted from the timetable. The island platform at Glenreagh Railway Station separated the mainline from the branch line platform and small goods yard as it is called in Australia. Trains carried goods, not freight, and you loaded them onto a goods train. Like so many relics from the days of the New South Wales Railways, finding and photographing them is just as much a rush for me as I imagine it is for a high-roller to win big at the casino. Glenreagh Railway Station is a reminder of history in motion. Heralded when it opened as progress, and quietly forgotten as it is left to perish. 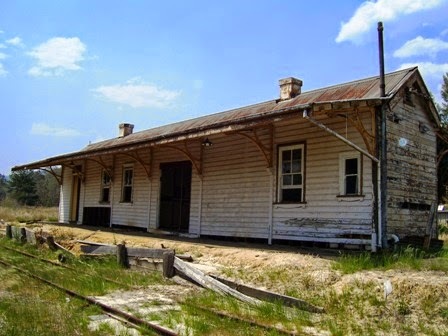 Being careful to watch out for snakes, and with my wife happy to wait in the car despite it being a hot day, I quickly explored the old station building and goods shed. The derelict former NSWGR passenger carriage had most of its seats removed and the floor was almost bare, except for the shards of broken glass that littered the floor. It seemed a sad way for an old warrior of the rails to eke out its retirement. While still keeping one eye out for snakes, something did catch my attention. The branch line that lay camouflaged in the long grass slowly inched away from the goods yard towards town. Hopping back in the car, I followed it back across the Orana River into town. Finding a sign called Railway Street that was absolutely nowhere near the old train station, I followed it a short way and soon discovered another hidden railway gem hiding in this tiny out-of-the-way town. A NSWGR Z19 class locomotive from 1878 is the only preserved and operational survivor of its class. It still haunts the rails on the Glenreagh Mountain Railway. 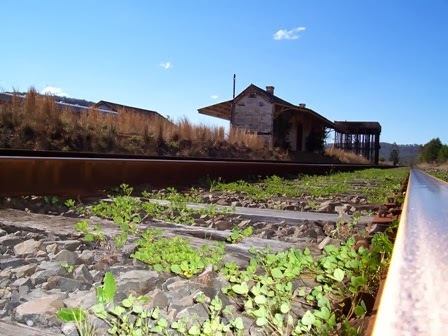 The Glenreagh Mountain Railway was established in 1989 by a volunteer preservation group who in 1999 acquired a 35 km section of the former Dorrigo branch line between Glenreagh and Ulong from the State Rail Authority of NSW. 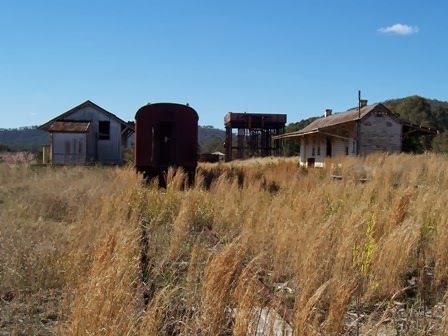 From December 2005, the Glenreagh Mountain Railway was operating steam train rides from its Glenreagh West Depot to Talawajah Creek and return, a distance of 7 kms. Although there are no scheduled operating days in the foreseeable future while the group raises some much needed funds to rehabilitate the line, one of the members was keen to take me inside and show me around their facility. And standing in the centre of their depot building is a ghost from an era long gone. A Z19 class 0-6-0 locomotive of which 80 were built between 1877 and 1891. 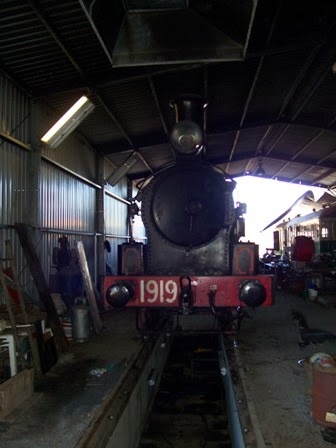 Engine 1919 is one of only four preserved, and the only one still operational. Once the volunteer group's plans are realised, trains will again run to Ulong and return. Until then however, there are two hurdles to overcome. Re-building the trestle bridge at Talawajah Creek, and raising the necessary money to re-open the short section of line to the general public. Maybe next time I'm passing through I'll get the opportunity to climb aboard the footplate and help fire up this ghost of the past. 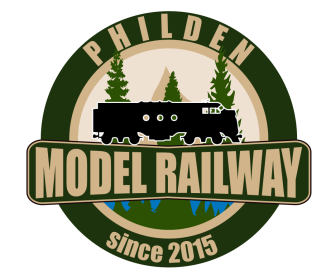 Author, poet and lifelong model railroader from the Sunshine Coast of Australia. Sixteen books to his name and still a lifetime of stories to tell. Caught up on your reading? ...a project so big it needed its own website! All materials on this blog remain the copyright of Phillip Overton. Picture Window theme. Theme images by andynwt. Powered by Blogger.